By Vijay Nayak, D.O., Jimmie Ton, M.D. MRI is the modality of choice for establishing the correct diagnosis. In the illustrative case above, the sagittal MR images demonstrate a cerebrospinal-fluid-filled, mid-thoracic posterior intradural lesion with decreased T1 signal (1A), increased T2 signal (1B), and pulsation artifact on short tau inversion recovery (STIR; 1C). 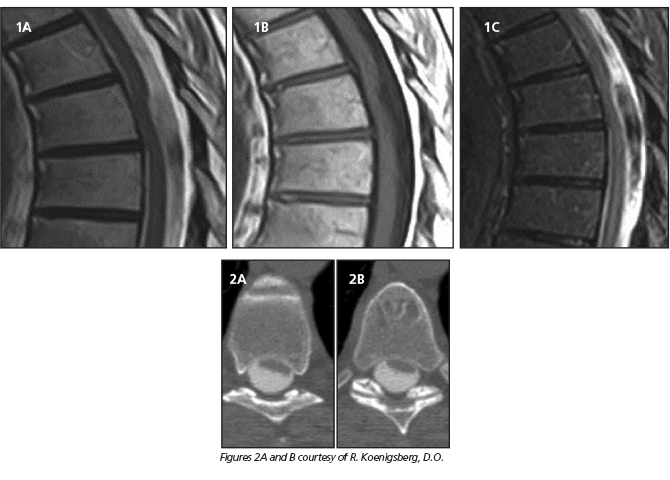 The axial CT myelographic images (2) demonstrate the same dorsal, intradural lesion, causing significant spinal cord compression. The cyst was surgically excised with symptom resolution. Wenger M, Zobor N, Markwalder R, et al. Intradural extramedullary arachnoid cyst of the thoracic spine associated with cord compression. J Clin Neurosci 2007;14(7):693-696.
da Conceição Araújo Filho S, Brito da Silva H, Freitas de Albuquerque LA, et al. Giant intradural extramedullary arachnoid cyst of the thoracic spine. J Clin Neurosci 2009;16:1369-1371. At the Viewbox: Thoracic Arachnoid Cyst Causing Cord Compression. J Am Osteopath Coll Radiol. Vijay Nayak, D.O., Jimmie Ton, M.D.